Artist, DJ, conceptualist and ambassador, more than anyone else in modern electronic music, Richie Hawtin has relentlessly proved himself to be a true innovator. The one-man mogul behind acclaimed Techno imprints Plus 8 & Minus sends signals out all over the world from his HQ in an old fire station in Windsor, Ontario – just across the border from Detroit Techno City. The signals are constantly evolving, his Plastikman persona gave Techno a unique face with a series of four ruthlessly minimal albums of skeletal beauty, while breathtaking festival live sets at Glastonbury and Tribal Gathering helped invent stadium Techno. His "Decks, EFX & 909" album released on novamute in 1999 expanded the concept of a DJ mix album beyond the imagination of most DJs. As a pioneering DJ and party promoter he was banned from entering America for 18 months. Yet this jet-setting international futurist is as at home exhibiting alongside acclaimed modern sculptor Anish Kapoor as he is headlining a bush rave with Josh Wink somewhere in Western Australia. More of a decade into his career, it's no surprise that the ever-youthful Hawtin is up to something new. This time, he's reconstructing the DJ mix album even further with "DE9: Closer To The Edit", the groundbreaking new album set for release on the novamute label in September 2001. His first mix album, for the Mixmag Live series, saw him use extra effects and drum machines as long ago as 1993, ‘Decks, EFX & 909' cut laser-style between tracks and now, "DE9: Closer To The Edit", sees Hawtin use his sampler to tear the skin and the flesh from the tracks until there's just a skeleton left, which he reassembles into a kind of Frankenstein's robot. The result is a mix album like you've never heard before. Hawtin describes this unique process "I recorded, sampled, cut and spliced over 100 tracks down into their most basic components. I ended up with over 300 loops, ranging in different lengths. I started to recreate and reinterpret each track and then put the pieces back together, as if an audio jigsaw puzzle – using effects and edits as the glue between each piece". A classic like Carl Craig's ‘4 My Peepz' (under his Paperclip People guise) breathes in and out in less than a minute, like a lonely spirit lost on the hard drive. 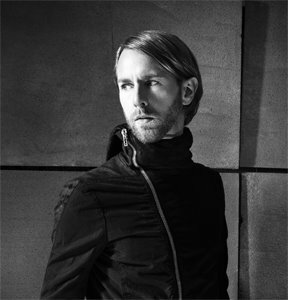 "I don't like mix CDs, everyone's being lazy, so I gotta do something different," says Hawtin. "Some people think it's about me using some extra equipment – a drum machine and some effects - but it's a whole philosophy really. 'Let's take it to the extreme, to somewhere that's it never been before' "
Hawtin believes the whole DJ thing is stuck in a groove. So beyond "DE9…" he is championing a new DJ system developed in Holland called Final Scratch, with Plus 8 partner John Acquaviva. Dance and Electronic music is the most technology-based genre of all, but to Hawtin's frustration it's still rooted in a music delivery system developed in the 19th Century: the gramophone record. Even though more and more DJs play tracks burnt onto CD, vinyl still rules because it's easier and instinctive to control. Final Scratch links up to the normal two-turntables-and-mixer set up, but lets you play tracks stored on a laptop using a special piece of vinyl as a ‘mouse', or controller. You can access literally thousands of tracks, and scratch, cut, slow and mix them just like normal records using this special piece of vinyl. It's nothing short of revolutionary. As Hawtin enthuses: "It feels and acts like a regular record." He's already using Final Scratch to play unreleased tracks by Josh Wink and Speedy J, and special re-edits of some of Hawtin's classics and personal faves. Born in Banbury, Oxfordshire, England, on June 4th 1970 Hawtin emigrated with his family when he was nine to Windsor, Ontario, where his dad Mick still works as a robot technician in the General Motors car factory (his mother, Brenda, is in real estate). Richie cheekily borrowed his dad's persona for his house alias Robotman. His brother Matthew, who shares the Windsor fire station studio complex with Richie, is a visual artist. By 15 Richie was creeping out of the house to cross the border and go clubbing in Detroit. By 17 he was DJing at The Shelter, a dark basement club where he mixed House and Techno with Industrial music by Nitzer Ebb and Front 242. He had his own show on Detroit's 96.3FM – inspired by a late '80s Detroit radio DJ called The Wizard, now better known as Jeff Mills. "It pissed a lot of people off because there wasn't anyone else in the city doing it – it took someone from the outside to come in and say, ‘Look, wake up,'" Richie recalls. "These guys [May, Atkins and Saunderson] have left. They're doing their thing overseas." Plus 8 began to gather momentum with a richly varied catalogue of hard-nosed, cutting edge Techno from artists like Speedy J, Dan Bell and Kenny Larkin. Along with the resurgence of Detroit's confrontational Underground Resistance, this marked the second wave of Detroit Techno. "We all put the focus back on Detroit for a while, we didn't want to make traditional Techno, we were inspired by traditional Techno. Derick, Kevin and Juan had sent these waves all over the world and we were the first to feel the rebounds of their ripples". By 1993 Richie Hawtin's Detroit parties had become legendary intense affairs as freaky dancing clubbers lost themselves in strange, dark warehouses transformed into disorientating warrens by walls of black plastic sheeting. Inspired by this, Hawtin elected to take Techno one stage further and develop his virtual Plastikman alter ego: a red and black gremlin that is tattooed on his forearm. He didn't want a collection of tracks; he wanted to make an album that swallowed up the concentrated energy of those parties and spit it back out as something new. An album, "Sheet One" was recorded in a rollercoaster 48 hour studio session and released on novamute in early '93 and was soon followed by the brilliant 'Spastik', a single recorded three weeks later after a long night dancing to Derrick May. Hawtin was already shifting identities like a spy changing roles: his 1992 album "Dimension Intrusion", under his Fuse alias, had played a key part in the Warp label's groundbreaking "Artificial Intelligence" armchair-Techno series, but he wanted to reach further. He remembered the strange shapes that his friends threw at those warehouse parties, the different creatures they almost became. "Like plasticine," he says. "That was the whole idea of Plastikman, it was all very viscous and pliable and moveable." Plastikman wasn't just a clever alter ego – it was a role for you to try on too. The sound was rubbery and sparse; its moments of melodic steel arriving unnervingly. The first album, "Sheet One", played up Hawtin's reputation for LSD and was promoted with a free sheet of fake acid tabs. Hawtin developed a Plastikman live show that still tours the world. Huge audiences at Glastonbury and Tribal Gathering twitched to its twittering insect rhythms, lost in a soundtrack far freakier than anything else those events had to offer. In 1994 the second album on novamute, "Musik", let a little human warmth seep onto the clattering Plastikman rhythms, but despite its closing robot lullaby ‘Lasttrak', it was, if anything, even more discomforting. "My girlfriend lived there and most of my experiences were in Detroit, my friends were there and all of my musical inspiration was there – and suddenly it was like, ‘See that building over there? You can see your inspiration, but you can't go there.'" Now, typically, he believes the ban had its benefits. It was at this point the Chemicals Brothers and Underworld began to break out of the dance world and into a wider Rock arena. Hawtin now wonders whether he might have gone further down the stadium Techno route. Instead, grounded in Windsor, he went back to the studio to reinvent. "When that happened it was the worst day of my life," he says now, "and it was one of the best things too." The next Plastikman project, ‘Klinik', wouldn't come together. "I had tried to follow those records up but there was feelings of pressure at that point," he says now. Stuck in the studio, depressed, Hawtin set himself a new challenge and gave it a deadline. He pressurised himself back into action, releasing a series of ‘Concept' EPs based on the months of the year. Each release would feature two tracks recorded in one month only using a set template of sounds. They would be released and then forgotten. The discipline of producing 24 tracks in 12 months rewired the creative circuits. "It progressed me to a different audience, it progressed me with effects which came into my sets and it progressed me into more of this spatial environment I was trying to get to," says Hawtin. It was the starting point for his last Plastikman album "Consumed", which replaced the angry black and red gremlin with dark, abstract sleeve art and the tense rhythms with swathes of bass and melody. Released on novamute in 1998, it was acclaimed in countries like France – where conceptual artists are traditionally celebrated. "Consumed" elevated Hawtin to a new status, he was now not just an international Techno star, but a contemporary artist. Asked to contribute to a French Millennium Exhibition celebrating different ideas of beauty, Hawtin created a musical installation based around the clicks, hisses and pops of vinyl – a beautiful sound, he argued, to his generation. The exhibition also featured the work of world famous sculptor, Anish Kapoor, who Hawtin had long been a fan. In fact "Consumed"'s unique textures had been inspired by Kapoor's beguiling, futuristic, curved shapes and the cover art echoed the sculptor's famous obelisk. "I was walking around those sculptures and putting my head into some of them. They had like a sonic quality like chambers of nothingness – and that's exactly what I was trying to hear. Suddenly I was able to walk around a physical version of what I wanted to do musically." Hawtin was also moved by the mournful purple washes of the late Mark Rothko, which now hang in London's Tate Modern. Rothko's work, says Hawtin, "is very, very subtle, just washes of texture. It kind of gave me a visual perspective of what I was trying to get out of my head, sonically. On a flat surface." "The good Techno musicians enjoy having a good time, but can see beyond it," Hawtin notes. "It's the closest to a contemporary art form." With Jeff Mills providing an installation to the recent Sonar event in Barcelona, Germany's Thomas Brinkmann moving from conceptual art into conceptual Techno, and increasing connections between the two worlds. Hey Richie, how much for the tomatoes? All times are GMT -4. The time now is 02:39:06 AM.